This is a strange one to even talk about in the context of vintage but I cannot help but think there is something here. The ability is staggeringly powerful in the right build, and I think that build is oath. She can replay things like Lotus or LED, Creatures that sac for effects, enchantments, fetch lands, and walkers every turn. I feel as if with the number of cards you may have just milled from oath there are piles you can construct where you just win on the spot. Key vault comes to mind, but also she can play snapcasters from discard to replay timewalks and recalls. Additionally she is cheap enough to be hard cast and she is in all the right colors. I don't see it yet myself but I have to believe this could be an oath archetype onto itself at some point. Thoughts? For what it's worth, I agree that there is something here that might be Vintage worthy. If you hadn't posted this I would have written something similar my self. Currently there are several infinite combos involving this card which use clone effects and Animate Dead to produce infinite mana and infinite opportunities to cast permanent spells from the graveyard. There are already EDH lists which are available based on infinite loops involving Muldrotha, the Gravetide. Preliminary testing appears promising in that format but EDH is not Vintage. The first questions I asked my self when I saw this card spoiled was whether it was better than the currently available graveyard recursion infinite combos that Oath grants access to. The two most famous of these engines are Black Lotus + Auriok Salvagers and Saheeli Rei + Sun Titan. Auriok Salvagers is easier to hard cast but does less things and costs more mana if you don't already have Black Lotus; therefore, Muldrotha, the Gravetide is potentially better if you're either not worried about having enough mana against a Graffdigger's Cage or if you are up against an opponent who has managed to exile your Black Lotus. If, for example, they have used Tormod's Crypt on your graveyard while lotus is in it then Muldrotha, the Gravetide has a greater potential to allow you to recur a broader array of permanents from your graveyard once you've refilled it than you could with Auriok Salvagers. You also don't need to play white to access them. If white is the fourth colour in your Oath of Druids build then that can mean a lot. Sun Titan is the same converted mana cost but again is white which, depending on other choices you've made in the colours of cards in your deck, can be more difficult to produce. The black tutors have a long history of being included in Oath of Druids decks so there is incentive on all sides when considering playing black as your third colour, playing a non-black third colour, or playing four colours. That is something that you'll have to decide when considering whether to play Muldrotha, the Gravetide in an Oath of Druids shell. I have played both Eternal Witness and Snapcaster Mage in Oath of Druids prior to this card being spoiled and I firmly believe that there is a potential meta that would allow that to be a worthy consideration but I have no idea if the current vintage climate in any particular locale or MTGO would be suited to playing those cards with Oath of Druids. The fact that they're not seeing play already leads me to believe they are not worthwhile inclusions at this time. Eternal Witness plus Muldrotha, the Gravetide plus a sacrifice outlet allows for multiple ways to take infinite turns with Time Walk or Time Vault but the same was always true of Sun Titan also and as far as I know there are no competitive lists aiming to do that. That suggests to me that it may not be playable in any particular meta at this time. I would expect it to be be similarly disincentivized in an Oath of Druids deck based on Muldrotha, the Gravetide. It seems likely to me that the best build which involves Muldrotha, the Gravetide would include an infinite mana loop involving Black Lotus, Animate Dead, and Dance of Many but would also include other value engines for situations where an opponent has managed to exile one of the combo pieces. It is also worth noting that this card is more susceptible to removal than most of the Oath of Druids targets which currently see play. You cannot access it's ability during your upkeep in the normal case which means this card does nothing against a well timed Swords to Plowshares or Karakas activation. This downside is reduced when Muldrotha, the Gravetide is cast from hand but when Oath of Druids places Muldrotha, the Gravetide into play there is the potential for it to do literal nothing against instant speed removal. This is the single most important downside to playing Muldrotha, the Gravetide over the already establish suites of Oath of Druids targets that are currently seeing play. I could imagine it seeing play in decks that are not Oath truth be told. BUG is no slouch to begin with and just putting a 6/6 into play and getting back a lotus, a land, and a creature is a pretty big swing in any sort of fair deck. Being on color is also a very real thing. Pitches to Force, a big upside compared to many other Oath fatties. Another big consideration: is this card better to oath into than Sun Titan? Sunny T isn't that much harder to cast, and does 90% the same thing as an ETB trigger, rather than a "it needs to survive to my main phase" deal. Not to get down on this card--but if we aren't going super nuts (so, "if we flip our Lotus, they exit, stage left"), Sun Titan seems like a somewhat more stable oath target. @neo_altoid My gut tells me this may be better. There is probably a huge list of pros and cons that I couldn't begin to wrap my head around. Hell being a static ability and not an ETB may be a good thing if things like Torpor Orb or Tocatli Honor Guard are a thing. But I think this discussion only applies to Oath. Suntitan is a non starter in BUG, where as this has a lot of long term late game value that could make it viable, as well as potentially having some combo we are not thinking of in and of itself. Probably this creature is not-terrible in an Oath Shell. But I’m skeptical that it leads to an optimal Oath build for the same reason I’m skeptical of Sun Titan: it introduces key weaknesses to the deck (susceptibility to graveyard hate) without adding a commensurate benefit. This could be a viable dredge target. Returning bazaar or a leyline or such. @serracollector you have to pay full cost, so you can only reasonably get leyline if you have a lotus/LED in the bin too. there aren't currently many lists playing the power/fatestitcher and the leylines. it gets back bazaar if you haven't already made a land drop that turn. if you have a land drop free the upside of this is better, get back an LED and a bazaar, but if you have used your land drop it's probably worse(than titan). lotus/fatestitcher decks also don't have room for stuff like ichorid/unmask/force to the same degree so pitching is less relevant. Seems like a good dredge Target. Except the existing targets straight kill the opponent, so I don’t really see this as an upgrade. The loop would be; have a muldrotha in play and play a clone effect (dance of many, phantasmal image), the original dies to legend rule and you now have a new one that doesn't remember what has been played this turn. Cast lotus from the yard and then cast either another clone effect or an animate dead style enchantment to get another muldrotha and continue the loop. I believe the card is worth considering, but I would think it goes more towards a worldgorger dragon/bomberman style deck than something like dredge. How good can a bomberman deck be with animate deads and clones? There is only so much space in a deck, so it definitely won't be easy to make properly. If I'm understanding correctly, when Muldrotha hits play you're going to need at least 4 cards in your graveyard (Dance of Many + Dance of Many + Black Lotus + Something to kill with after you generate mana). 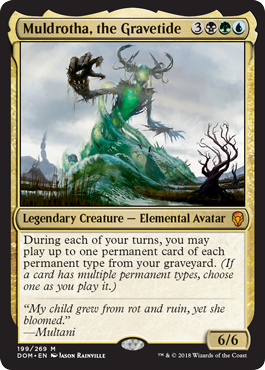 This doesn't feel like it stacks up too well against Sun Titan, which just needs 2x Saheeli Rai. Sun Titan and Muldrotha are pretty comparable in terms of castability and value outside the combo, I might give the edge to the Titan for not being a legend. Thats right motherfuckers. We can flip over our whole deck. Dread return Muldrotha into play. Its all just style after that. @brass-man I should have included it in the post. Play Muldrotha, the Gravetide (possibly from command zone off of Lion's Eye Diamond or maybe off of Oath of Druids. Doesn't matter) then use the ability to cast a clone effect. People talk about Phantasmal Image a lot but I prefer Dance of Many. Copy Muldrotha, the Gravetide and allow the original copy to die to the legend rule. Next cast Lion's Eye Diamond from the graveyard; or in our case, Black Lotus. Sacrifice it for enough mana to cast Animate Dead targeting the original Muldrotha, the Gravetide which is in your graveyard due to state based effects (Legend Rule). Then repeat with Dance of Many replaying Black Lotus again until you have as much mana as you want. Then you can use that mana to loop Muldrotha, the Gravetide and cast every non-enchantment permanent in your graveyard as many times as you want. I guess one advantage of using Phantasmal Image over Dance of Many is that you get to loop infinite enchantments spells from your graveyard which you couldn't do otherwise. Another difference between Muldrotha, the Gravetide and Sun Titan is that you don't have to play Saheeli Rai. I would expect to be able to pull more in-game value out of Dance of Many or Animate Dead than two copies of Saheeli Rai but maybe I'm missing something. @brass-man Listen, I am bringing 4 Horsemen to my next local event. Honestly, I don't think Combo Oath is where you want to be right now - you are essentially compounding the inconsistency of Oath with combo pieces without obvious gain. When Mentor was unrestricted with Gush and Probe, you often couldn't pass the turn back to the Mentor pilot or they could chain enough spells together to attack through Griselbrand. It's why Inferno Titan has risen to prominence after the restriction. This card interests me outside of combo applications - you can recast Dack, Pernicious Deed, 3Ball, Null Rod, Lotus and replay Strip Mine each turn. Some people have tried value takes like this with Sun Titan while eschewing the Sun-Rai kill. It seems attractive as a castable sort of value creature similar to Titan, but possibly in better colors. The downside is that it's vulnerable to Pyroblast, which is not a good place to be right now. And it doesn't get around Grafdigger's Cage like other castable creatures.